The grand old Second Avenue Deli, once a fixture in the East Village, survived its recent near-death experience to emerge, phoenix-like, as a thriving concern on E. 33rd Street. Things are apparently going so well at the new location that deli heir Jeremy Lebewohl has plans to open a second space on First Avenue and 75th. One critical remnant of the original deli, however, remains stuck on Second Avenue, withering in the florescent glare of the Chase bank branch that consumed the old storefront. Passersby who are new to the neighborhood must wonder why plaques engraved with the names of Yiddish Theatre stage stars align the sidewalk outside the bank. 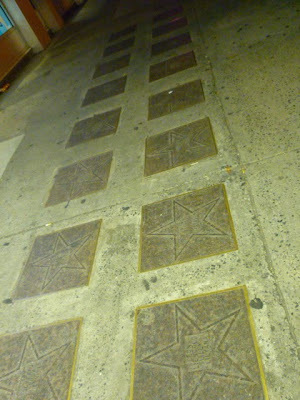 The Yiddish Walk of Fame, which is modeled after Hollywood Boulevard’s monument to the stars of the silver screen, was installed in 1984. More than 30 stars are honored, many whose names are no doubt unknown to the modern public. The Lebewohls decided not to bring the plaques with them when they moved, which places the walk in a sort of limbo. Certainly, the walk was situated outside the deli, and not somewhere else, due to the eatery's connection to and feeling for Second Avenue's formerly theatrical past. And, just as certainly, the owner of the building that housed the deli didn't, and doesn't, give a hoot about the nabe's history. Yet, the walk is now the possession of the building’s owner, Jonis Realty. In New York City, property owners are responsible for maintaining the sidewalks in front of their buildings. But it doesn't look like anything is being done to keep the plaques in good shape. The names just fade away with each passing footstep. Part of me understands that the plaques should stay on Second Avenue, where the actors honored made their mark and plied their trade. But the other part wishes the Lebewohls would find a way to remove the walk of fame to their new building (which they own). It's there where anyone who remembers the Yiddish Rialto is going to go eat, not on Second Avenue, and its there where the plaques will be appreciated. Tearing up a sidewalk they don't own anymore to recover plaques which are already in lousy shape would probably be more trouble than it's worth. I wonder if it wouldn't just make more sense to just put new plaques out on 33rd st.
Hm. You're right, Rob. That might be a better idea. I like the idea of the old plaques staying put -- what else will remind pedestrians that there used to be something other than banks on street corners? Interesting Photo, perhaps the the best solution would be for another theater group to step up and preserve the walk of fame. lower east side,but it ain't Waspy enough,after all it's only history. I don't really know how the rules work for such things, but it seems that section of sidewalk should be landmarked or preserved somehow. The plaques make no sense on 33 St. They don't even mean that much where they are (hell, I've walked past/over them many times but never looked closely) but I still think they should stay there to honor the neighborhood. The sidewalk law was changed c. 2004-5. Did property owners have the right to stick anything they wanted in the sidewalk before that? I know they did have the responsibility before that to maintain sidewalks which had a "special use," but could they freely create that special use by installing plaques like these?